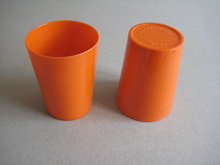 This is a nice pair of orange Bandalasta beakers. 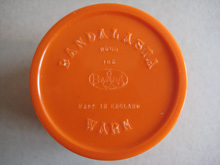 In the Bandalasta catalogues they were called drinking horns. Each beaker is marked on the base with the Bandalasta name and also the item reference number, 165. The colour is reference Y8. The beakers have been used but they are in good condition. UK postage & packing £3.30. Payment is via PayPal secure payment checkout.